Please count me in for 1. Thanks. I guess you should be “promoted” to a team member!!! I help what I can. Pero, estas haciendo un trabajo muy bueno y de gran valor para lo seguimiento de este proyecto Gracias!! I’ll take one as well…Thanks BLF and all who’ve worked on this design !!! Forgive me for not going through 75 pages of messages, is there a lumen output approx. on this light? And any idea how long until completion? Output of FET triples is pretty well established and tends to be between 2000 and 3500 lumens depending on emitters. Last I checked a 219C (90 CRI D240 flux) FET triple, it was about 2500. A low-CRI XP-G3 (or low-CRI 219C for that matter) would be higher. Candle mode is updated and more realistic now, simulated using six oscillators — three of which modulate the other three like an old analog synthesizer. The result looks similar to a candle with periodic disturbances in the air. Fixed a bug in thermal regulation and LVP, which were both running about 1000X faster than intended. So, those work again. Thermal regulation uses 512 internal steps while searching for a sustainable level, which makes the adjustments invisible by eye. A lux meter is needed to see what it’s doing. Made thermal adjustment speed change depending on how far it needs to go. It can happen anywhere from 1 step every 8 seconds to 8 steps per second. Added the ability to calibrate the thermal sensor to room temperature. This should help with the issues related to different attiny85 units disagreeing on how warm it is. Very sweet ToyKeeper! Thank you! Nice TK!! … Thank you. I’m in for a single FW3A. Oh, I forgot… I also made lockout’s moon mode use the current ramp floor. Previously it used whichever floor was lower. So, the momentary illumination in lockout mode can effectively have two settings depending on which ramp you left active. In case this doesn’t ring a bell, lockout mode doubles as a momentary moon mode. That way, after locking it and tossing it in a bag, it can still be used to look around inside the bag without unlocking it. There have been some complaints about the mid-ramp blink on the D4. I find it useful as a reference point, but some dislike it. Should the FW3A have mid-ramp blinks? Smooth ramp floor: Lowest setting which lights up. Stepped ramp floor: About 10 lumens. Blink when passing 1×7135 boundary, ~150 lumens, or level 65/150. 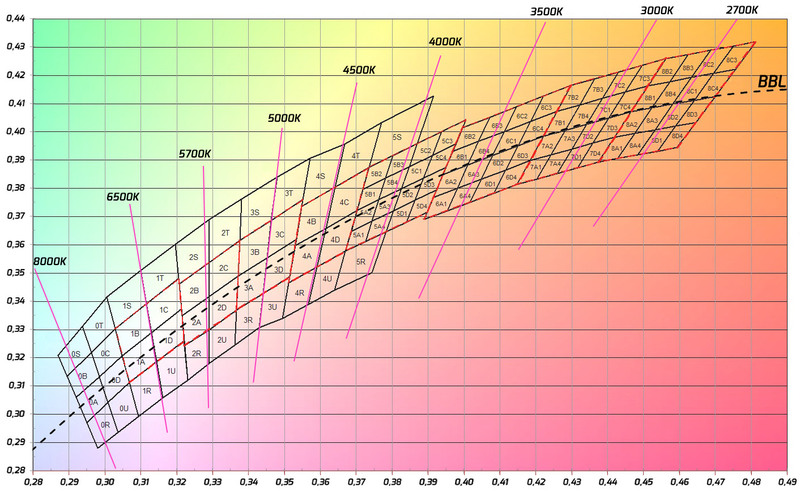 Blink when passing 8×7135 boundary, ~1000 lumens, or level 130/150. Blink when ramp hits ceiling. No blink at moon, because it’s usually pretty obvious when it hits bottom. A “blink” means the light shuts off for 8ms. Each ramp step takes 16ms. So, it’s off for half of that individual step, half of a 60fps “frame”, just long enough to see. So… which of the following reference points should blink when the user hits or passes them? Some prefer “none”, some might like “ABCD”. I like “BC”. What sounds good to you? When ramping down to the floor (or up to the ceiling) won’t it simply stop? If so, I don’t think they need a blink. I like the blink on my D4 so I wouldn’t mind B and C to give a point of reference as to the power I’m using. That said, I wouldn’t care much if no blinks were the consensus. Toykeeper is definitely the queen of flashlight drivers! That new UI is droolworthy!!! […]So… which of the following reference points should blink when the user hits or passes them? At the same time, it is appropriate to inform the people interested on this light about the FirmWare it will probably use! If we pass the C blink, we know the farthest regulated limit has been passed, so we may wanna go back a bit to enter the “regulated zone”, helping to save some battery even with it producing near 1000 lumens. Sometimes I see myself pressing the Emisar D4 switch trying to realize when it reaches the highest limit, when ramping up. If there wasn’t any “top blink” we might get “stuck” pressing the switch, because we don’t know if the highest limit has been reached or not. So, the “top” blink would be a nice indicator to let us move the finger away from the switch! Obviously, as you said, the moonlight is easy to perceive when it is not getting lower! If it will be regulated till the 1000 lumens, would it be necessary to have a previous blink to know the 1st regulated limit? Sure, it would help to save some more “juice” from the battery and produce less heat, but comparing to the D4 (as example), this one will have a wider regulated “space” so I don’t see a need for the B blink. 2 would be great to mark some important points, but at least 1 (the C) may be important to have it! Toykeeper is definitely the queen of flashlight drivers! Dale sent me a diffuser for my BLF Q8, and it makes the candle mode look a lot more like a candle. The light is warm-tinted and spread evenly in all directions. Everything still works without a diffuser, but for that it’s best to ceiling-bounce the beam. Please put me on the list for one of these. Whoa that’s awesome! 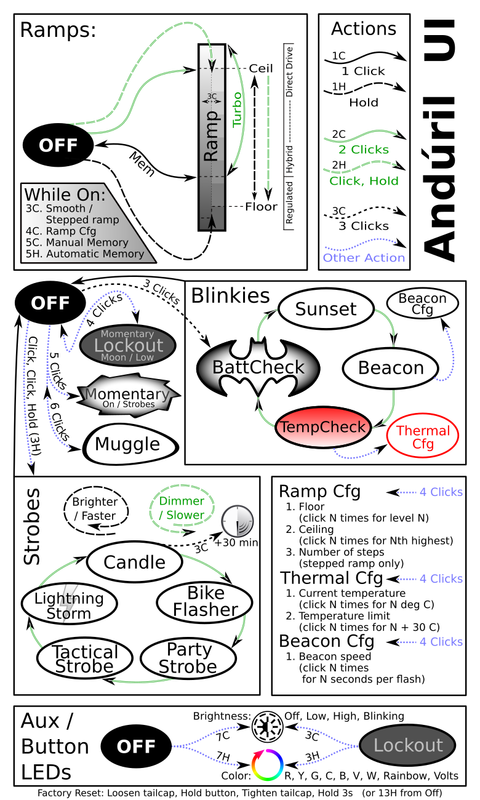 And i thought Zebralights had complicated UIs. Makes me want 2 now……this place is really bad for my wallet. Candle mode is sweet TK! Hi Miller, I am interested for 2 units. Hi there. Please put me down for 2 units. Seems my post from Nov 19,2017 was missed. And i thought Zebralights had complicated UIs. FWIW, the FW3A can run a clone of ZebraLight’s 2016 UI too, if you reflash the driver. It’s in the FSM repository under “DarkHorse”. It took only a single afternoon to implement ZL’s UI. Thanks ToyKeeper (and the rest of the team) for your work on the FW3A. I’m really looking forward to seeing the finished torch, and then probably flashing Anduril onto everything that can run it. I’d like to give a +1 to MascaratumB’s suggestion of blinks at point C and D, but I also have a question. When you reach reach either the minimum or maximum ramping level, does the light simply stop adjusting, or does it start ramping back in the other direction? I would like to be on the list for a second light.